Once again, this week’s FacilityBlog Friday Funny begs the question, what will they think of next??? Take your office “from boring to bling” with Pimp My Cubicle from Reverend Smoothello G. Debaclous. Recently featured in Newsweek, this additon to the office has been called the ultimate in niche marketing. Put some mojo back into your office! 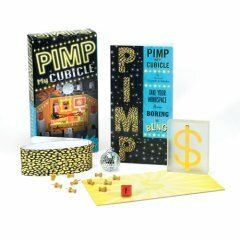 This tongue-in-cheek kit contains everything you need to pimpify a bland and uninspired workspace: a dollar-sign paperweight, gold push-pins, leopard print fringe to run around the edge of your cubicle, a disco ball, and “Bling” mousepad. But if that doesn’t quench your thirst for individuality, check out the accompanying book for more design schemes. From a beach front theme to the Taj Mahacubicle, you’re sure to find something that appeals to your inner pimp. With Pimp My Cubicle your workspace can become the hottest and most talked about stop on the way to the water cooler! Straight from Amazon.com. Want to see for yourself? Click this link. Is this a spring cleaning-related phenomenon? Previous articleSick at work or sick of work?